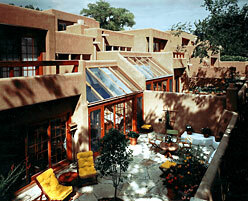 La Vereda Compound is a 27-unit condominium development in Santa Fe's historic district. Mazria Inc. was responsible for both site planning and unit design. Each unit contains approximately 2,500 square feet between two levels. Energy conserving techniques were combined with traditional northern New Mexico forms to create a unique expression within the district. The building mass is articulated into small blocks that cascade down the south facing hillside creating terraces and balconies off bedrooms and living spaces. These outdoor rooms are warm and protected in winter and are used throughout the year.